Quneitra (also Al Qunaytirah, Qunaitira, or Kuneitra; Arabic: ? al-Qunaytrah) is the largely destroyed and abandoned capital of the Quneitra Governorate in south-western Syria. It is situated in a high valley in the Golan Heights at an elevation of 1,010 metres (3,313 feet) above sea level. 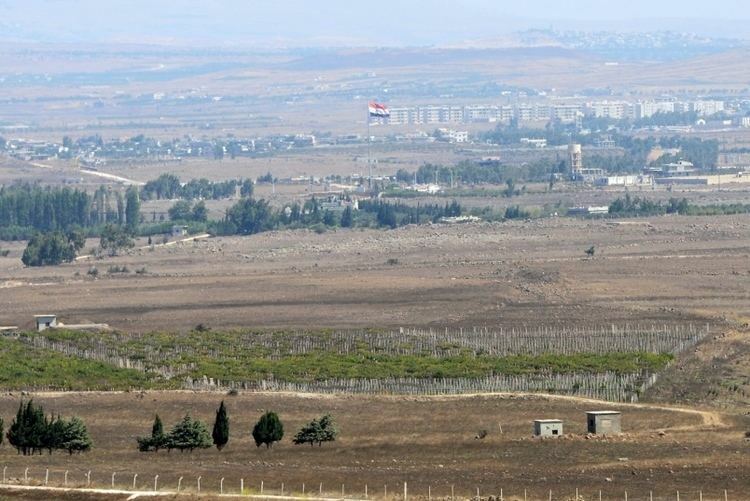 Quneitra was founded in the Ottoman era as a way station on the caravan route to Damascus and subsequently became a garrison town of some 20,000 people, strategically located near the ceasefire line with Israel. Its name is Arabic for "the little bridge". On 10 June 1967, the last day of the Six-Day War, Quneitra came under Israeli control. It was briefly recaptured by Syria during the 1973 Yom Kippur War, but Israel regained control in its subsequent counter-offensive. The city was almost completely destroyed before the Israeli withdrawal in June 1974. It now lies in the demilitarized United Nations Disengagement Observer Force Zone between Syria and Israel, a short distance from the de facto border between the two countries, and is populated by only a handful of families. Syria refused to rebuild the city and actively discourages resettlement in the area. Israel was heavily criticized by the United Nations for the citys destruction, while Israel has also criticized Syria for not rebuilding Quneitra. Quneitra is situated in a high valley in the Golan Heights at an altitude of 942 m (3,091 ft) above sea level. It is overshadowed to the west by the Israeli-held portion of the Golan Heights and the peak of Har Bental. The surrounding area is dominated by ancient volcanic lava flows interspersed by a number of dormant volcanic cones which rise some 150–200 m (500–700 ft) above the surrounding plain. 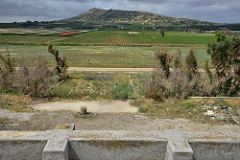 The volcanic hills of the region have played a key role as observation points and natural firing positions in the conflicts over the region, most notably in the Yom Kippur War. In more peaceful times, the fertile volcanic soil has supported agricultural activities such as wheat growing and pastoralism. charmingly set in a grove of eucalyptus trees. Its chief claim to charm or the few moments of a travellers time beyond passport formalities is the beautiful vista which it offers of Jordan as it flows down from Hermon through banks of tangled bush and flowering pink and white oleanders. Kuneitra is pleasant as a stopping-place for lunch. It is cool under the spreading trees, usually quiet and restful. The citys position on an important trade route gave it a varied population for much of its history. By the start of the 20th century it was dominated by Muslim Circassians from the Caucasus. Its population grew to some 21,000 people, mostly Arabs, following Syrian independence from France in 1946. After its abandonment in 1967 and subsequent destruction, its population was dispersed to other parts of Syria. The city remains abandoned apart from a residual Syrian security presence. The surrounding area has been inhabited for millennia. Palaeolithic hunter-gatherers are thought to have lived there, as evidenced by the discovery of Levallois and Mousterian flint tools in the vicinity. A settlement was established at least as early as Roman and Byzantine times, serving as a stop on the road from Damascus to western Palestine. Saint Paul is said to have passed through the settlement on his way from Jerusalem to Damascus. The site of the Conversion of Paul was traditionally identified with the small village of Kokab, north-east of Quneitra, on the road to Damascus. In 1868 a travel handbook reported that the site was a "ruined village of about 80 or 100 houses" and that a large caravanserai also stood in ruins. The Ottoman Empire settled large numbers of Circassians in the Golan region after 1878, who built Quneitra and a number of surrounding villages. The modern city grew up around the nucleus of the old Ottoman caravanserai, which had been built using the stones of a ruined ancient settlement. By the mid-1880s, Quneitra had become the main city and seat of government of the Golan. Gottlieb Schmacher wrote in 1888 that it "consists of 260 buildings, which are mostly well and carefully constructed of basalt stones, and contains, excluding the soldiers and officials, 1,300 inhabitants, principally Circassians." During World War I, the Australian Mounted Division and 5th Cavalry Division defeated the Ottoman Turks at Quneitra on 29 September 1918, before they took Damascus (see also Battle of Megiddo (1918)). Quneitra saw several battles during the Syria-Lebanon Campaign of the Second World War, including the Battle of Damascus and Battle of Kissoue.